A thief-turned-saint, killed by an insult. A rabbi burning down his world in order to save it. A man who lost his sanity while trying to fathom the origin of the universe. A beautiful woman battling her brother’s and her husband’s egos to preserve their family. Stories such as these enliven the pages of the Talmud, the great repository of ancient wisdom that is one of the sacred texts of the Jewish people. Comprised of the Mishnah, the oral law of the Torah, and the Gemara, a multigenerational metacommentary on the Mishnah dating from between 3950 and 4235 (190 and 475 CE), the Talmud presents a formidable challenge to understand without scholarly training and study. But what if one approaches it as a collection of tales with surprising relevance for contemporary readers? 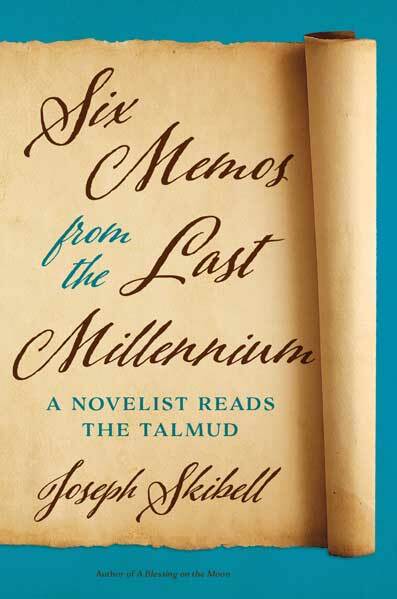 In Six Memos from the Last Millennium, critically acclaimed novelist Joseph Skibell reads some of the Talmud’s tales with a storyteller’s insight, concentrating on the lives of the legendary rabbis depicted in its pages to uncover the wisdom they can still impart to our modern age. He unifies strands of stories that are scattered throughout the Talmud into coherent narratives or “memos,” which he then analyzes and interprets from his perspective as a novelist. In Skibell’s imaginative and personal readings, this sacred literature frequently defies our conventional notions of piety. Sometimes wild, rude, and even bawdy, these memos from the last millennium pursue a livable transcendence, a way of fusing the mundane hours of earthly life with a cosmic sense of holiness and wonder.